Home » wordpress plugins » How to Create an Instagram Slider in WordPress? How to Create an Instagram Slider in WordPress? Instagram has grown at a rocket pace to become one of the most popular social media platforms today. It’s not just meant to be a personal photo journal anymore. Like how WordPress grew from being a blogging platform to a powerful content management system, Instagram became a platform that draws the attention of millions of people. If yours is a website that has rich content with mostly text, an Instagram slider in WordPress will add a splash of colour to it. With an Instagram slider in WordPress website, you will be able to garner more viewers and traffic. Instagram sliders are great because they are engaging and a visual treat. The process of creating an Instagram slider in WordPress website is very easy task no extra skills are required for it. With the help of some of the best plugins, you can do this in a jiffy. There are many ways how you can create an Instagram slider in WordPress right here. Let’s take a look at some of the best plugins you can install for an easy way to create an Instagram slider in WordPress. Some of them are free and a few are premium. The free ones don’t offer too many customizations but are still pretty great to install for an attractive Instagram slider. The premium ones do come at a cost, but if you need serious customization options, you can go for them. Either way, your Instagram slider in WordPress will look many notches better. With this plugin, you can get a shortcode generator that lets you display your Instagram galleries anywhere on your web page. With Alpine PhotoTile, you can have your Instagram account under a virtual spotlight for your viewers to focus on. Simple Instagram Embed is indeed a simple embed. This plugin allows you to take the embed codes from the Instagram’s photo post link. Simply paste the picture’s URL instead of using the code found Instagram. As direct as its name, Instagram for WordPress is a plugin that will allow you to show off your Instagram grid on your website’s sidebar. You can display your own Instagram feed or any other feed you wish. For a rotating slider of your Instagram grid, which displays 20 pictures, Instagram Slider Widget is your go-to plugin. You can control the order in which the pictures are displayed and even when you want the slider to be updated with fresh images. Instagram Theater is not a free plugin, but it has great value. This premium plugin allows you to customize your Instagram feed in many ways. You can have pictures pulled from a hashtag, username or any popular feed you may want to display. This plugin also allows you to have multi-user feed, which means it will need API access to use all the features. But it is totally worth it. Enjoy Instagram lets you use shortcodes to display pictures. This is a great plugin if you want users to focus more on your Instagram. It displays pictures in a carousel so it’s a lot more appealing than them being on the sidebar. 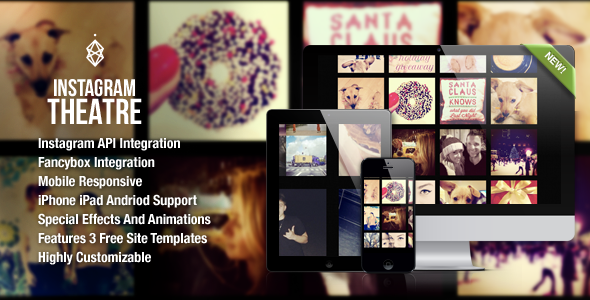 The slider operates in lightbox mode, which helps in drawing more eyes on your Instagram account. For a quick and effective Instagram slider in a WordPress website, there’s Soliloquy. It’s very easy to install and activate. Your Instagram images will look stunning on the website in a slider. With a widget, you can either have your own profile’s images displayed or have images pulled from hashtags and other profiles. Yakanda plugin allows you do either and displays the images as a widget itself or as a gallery. Instagram Feed by Smash Baloon is a free plugin that, like many other plugins, allows you to display multiple feeds. But the difference is that it consolidates the images into one single feed, making it cleaner. It also allows you to customize your slider based on size, colour, and layout. The Instagram Feed WD plugin by Web Dorado is also free. But with it being free, its customization options have limitations. So, if you’re looking for a more basic and easy plugin to install, and do its job of creating a good Instagram slider, Instagram Feed WD is a good option. The same Instagram Feed WD comes with a premium that offers much more customization options. If you’re looking to invest in a good premium plugin, this is your answer. The premium version offers you fully customizable layout, filtering, feed, and even comment integration. If you have a strong Instagram feed that you must link with your WordPress website, Instagram Feed WD – Premium is the way to go. This plugin is not free. Although it has its basics right, you can customize the header image, colour, and the length of the feed strip. You can even remove the header image if you don’t want it. It’ll give you a great looking Instagram slider in WordPress, but at a cost. It sure is worth it for a solid plugin. Instagram is a great tool to catapult you into the social media world. With your Instagram slider in WordPress, you can stay connected with current trends and stay connected with your users. This is a great tool especially if you are active on social media and want to give your followers an all-round experience of your website as well as Instagram feed in one place. You need an Instagram slider in WordPress to highlight your profile with relevant images or for you to showcase images from trending and popular hashtags along with images from other profiles. Depending on the content of your website, Instagram can help you gain more traffic to your website. All the plugins we mentioned will help you engage with your users. People online have very short attention spans. And with relevant images from your Instagram slider in WordPress, you could have people staying on your website longer without bouncing off to other websites. This entry was posted in wordpress plugins on March 29, 2019 by SKT Posts Themes.